The Nuffield Foundation’s Research Placements scheme provides over 1,000 school students each year who contribute to real research projects hosted in a HE or research institution during the summer. The work gives them a real insight into scientific research and they gain from working alongside professional researchers. During summer 2013, Dr Simon Cuthbert at the University of the West of Scotland hosted student Carly Robertson from Prestwick Academy, who carried out a palynological study of the peat deposits in the Clyde-Muirshiel Regional Park. 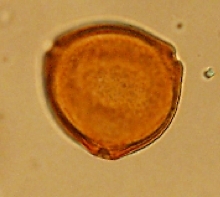 Palynology is the study of pollen preserved in rocks or soils, and provides information about the vegetation that existed in the ancient past. 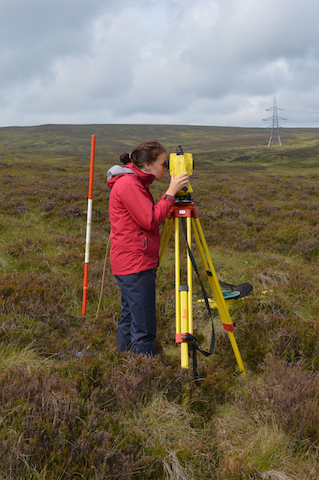 Working with UWS PhD student Uche Chiukwura, Carly investigated the vegetational history from the end of the last ice age about 8-10,00 years ago; her work involved cartographic surveying of the site, collection of a peat core (hard work!) and examination of the pollen under optical and electron microscopes. Carly said “I really enjoyed myself and it has set me up perfectly for studying Earth Sciences at University”. As a result of her project at UWS, Carly obtained a CREST Award (Creativity in Science and Technology), a nationally recognised award scheme that accredits research carried out by students. Carly presented a poster at the Nuffield Celebration Event in Edinburgh in September, where nearly 100 students showed their work. There were only four Earth Science-related projects on show; it would be great to have more next year, so if you’re a geography or geology teacher, please encourage your students to have a go, and if you’re a student with a passion for Earth Science, why not apply? !